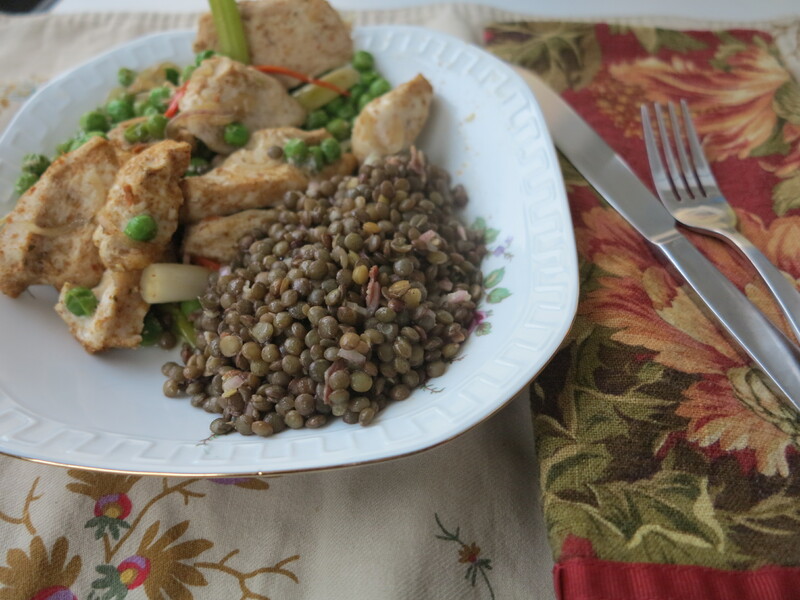 As was caught by a few sharp-eyed Doristas, I combined two weeks of French Fridays with Dorie recipes into one and served my French Lentils with last week’s Curried Chicken. September is set to be a busy month around these parts and with only one weekend at home, I need to be as efficient as possible with my kitchen time. Speaking of which, we had a great time in Paris last weekend. My husband contained himself to only one eclair per day (no small feat) and we both discovered a dangerous new favorite, Alain Ducasse’s bean to bar chocolate shop in the 11th. Oh my! A splurge for sure, but worth every penny! I want to go back and buy another box of just his nut chocolates. My mouth of watering just thinking about it. In fact, I’m now having a little difficulty switching over to healthier topics, namely, this week’s French Fridays with Dorie recipe, French Lentils. Lentils are one of the few beans which I am actually willing to make from scratch. Our water here in Frankfurt is so hard that every other attempt at making beans has failed miserably. My mother in law finally told me recently that I just need to add some baking soda to the cooking water to help them soften. But by the time she shared this little nugget with me I had already discovered the blissful ease of canned and now there’s no going back. Puy lentils are easy enough to find in Frankfurt and I usually have a pack in my cupboard. 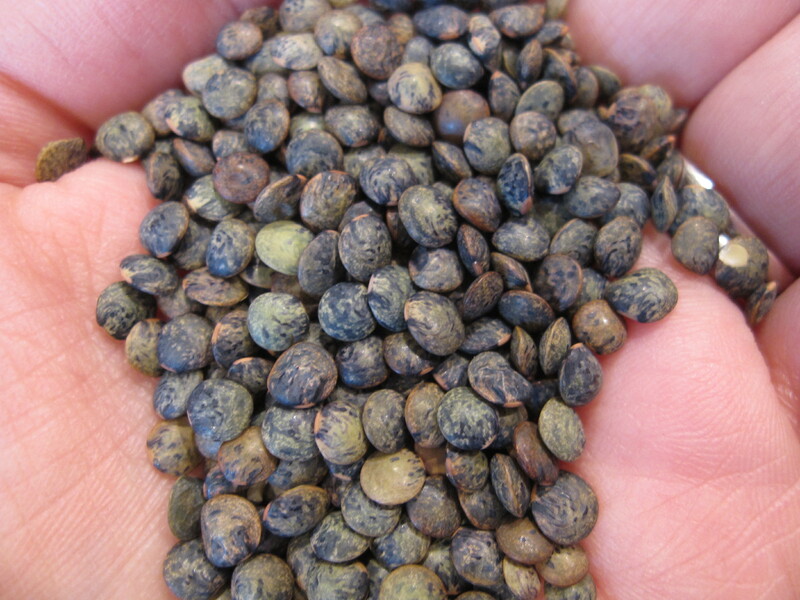 Raw, these little lentils are a pretty swirly green color. Cooked, they tend to look like normal lentils, except that they hold their shape a bit better and are less likely to go mushy, which is why I prefer them. Dorie’s is the traditional base recipe but I tend to like to jazz my lentils up a bit with some chopped walnuts and goat cheese. Oh so tasty. I don’t think I’ve ever actually seen puy lentils in real life, either in the states or here in italy. Maybe I’m not looking in the right places. I like their marbeled design. Now I know what they should look like raw, so that’s a step in the right direction. I was all set to cook these lentils for dinner tonight, until I realized that my husband’s plan to make kartoffelzuppe (is that spelled right? I don’t speak German) for the Oktoberfest party we’re hosting tomorrow was going to destroy my kitchen tonight, and so we ate leftovers instead. I really need to start planning my dorie recipes earlier in the week. Thanks for the walnut and goat cheese tip! I never heard of that combo with lentils. I’ll definitely give it a go. Hope your month isn’t as hectic as planned, and I’m glad you had a great Paris trip. Lentil du Puy are not always easy to find around here, but Whole Foods carry them so I usually stock up. I loved serving mine as a salad with some goat cheese…delectable! Yours look wonderful served with the chicken! Happy weekend, Rose! and lentils are one of Jim’s favorites. This does look tasty. I enjoyed these lentils, even though I did not use du Puy ones. Rose, how wonderful to read that you really enjoyed your trip to Paris and discovered a wonderful place for sweets (or chocolate nuts etc.) – your lentils look fabulous and what a great idea to add some chopped walnuts and goat cheese to the finished dish – lovely meal together with the curried chicken! Walnuts and goat cheese sound fantastic with this lentil recipe. I will be trying that on the leftovers. I’ve always lived in places with hard water and have always cooked beans from scratch in a pressure cooker. That seems to be the only way to make them well. I am going to have to add walnuts and goat cheese to my next batch. Sounds like you had a terrific time in Paris! SO jealous that you were at Ducasse’s store. I LOVE that place! And look at your lovely lentils! Your trip to Paris is making me drool. I must learn to make eclairs. This was a great meal to combine. And you are right canned beans are so convenient. A lovely time in Paris! Thanks for sharing. The two FFwD dishes look fab together! btw, the chicken b’stilla filling makes a great sandwich! Hope to make it properly with filo pastry soon! Love the idea of walnuts and goat cheese with this. And so glad you had a great time in Paris. I admit to using canned beans a lot (save for lentils), too. There are so many things I want to do in my small kitchen, why soak beans for hours when canned are nearly as good? Walnuts and goat cheese go with lentils so perfectly. Great way to dress it up. I love Puy lentils for the same reasons you do. Fortunately, I can usually find them when I need them. Nice pairing with the chicken in a pack. You’re making me hungry. Walnuts & goat cheese, very nice! Glad you had such a lovely trip. We went to a bean to bar shop in Brooklyn a couple of weeks ago and even me (not a huge chocolate fan) loved it!